I’ve known James and Sunny for almost 5 years now, including about a year or so of James being my first triathlon coach. Athletes like James, who I first met at Ironman Louisville in 2012 while he was doing his 30 Ironmans in a year, are the reason I got into triathlon – because I wanted that mental strength that I saw in James that I felt I didn’t have in myself. Almost 5 years later, and after reading this book, which provided so many missing pieces from what I could gather on Facebook during the 50-50-50, I finally figured it out from one line in the book – where the mental strength REALLY comes from and what it REALLY means. Sorry, I’m not going to spill the beans, you’ll have to read it yourself to find out what it was that got James and their family through such an incredible adventure! Honestly, I can’t believe James you completed these 50’s. I can’t put the book down, I’m crying for your suffering and then crying at your humbleness. I love when the angels come to your rescue. My eyes are constantly moist James what a great lady wife mother friend and supporter you have. I’m so glad The 2 of you came into my life. Your whole family is an inspiration to me. How the girls encouraged You and cute little Quinn running to your rescue and wrapping his legs around you. The book and the 50 being a family project goes to show you how important family is. What a great example you’ve been to the world!!! Just read the whole book cover to cover in one day – even though it was supposed to be an early birthday present for my husband, and finding so much inspiration for MYSELF! 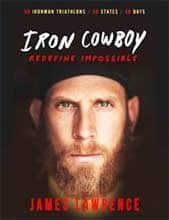 I was moved to tears more than once- what an amazing story, full of raw emotion, heartbreak, personal experience, the good days & so motivational! I’ll just remember the Iron Cowboy and just keep my eyes to the finish line(s)! Lawrence’s biography is a story of strength, both mental and physical, of resilience while facing trial and betrayal, and of endurance when everything that can possibly go wrong, goes wrong. It will make you want to achieve ‘your’ impossible. This book will change you! I absolutely loved this book!! I couldn’t put it down! I didn’t know what to expect, and I was pleasantly surprised at how much of a page turner it was. Well written, great story with great messages!!!! LOVED IT!! !